Support the market by purchasing a gift certificate and introducing a friend to the market! CWFM is a project of the Cambridge Community Center and takes place in its gymnasium on Saturdays, January through April. 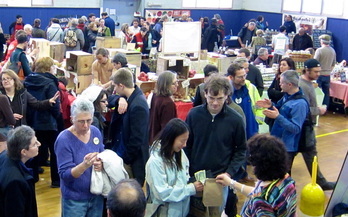 The average attendance was 600 adults per market day, and lots of children too! If you feel your mission is aligned with ours and you'd like to become a market sponsor please contact Anna Pierce-Slive, market manager at annaps@cambridgecc.org for more information. Give your neighbors the gift of food! ﻿Help your low income neighbors eat the delicious, local food that our market vendors sell by contributing to the SNAP-matching fund. 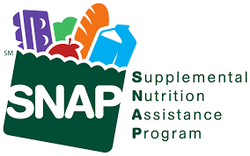 This fund increases the buying power of low-income shoppers at CWFM who use food stamps, now known as the Supplemental Nutrition Assistance Program, or SNAP. On average, these folks receive just $3/day in SNAP credit to buy food for a month. If a shopper spends any amount of SNAP credit in our market, we give them a matching amount in market currency -- up to $15 per customer, per market day.